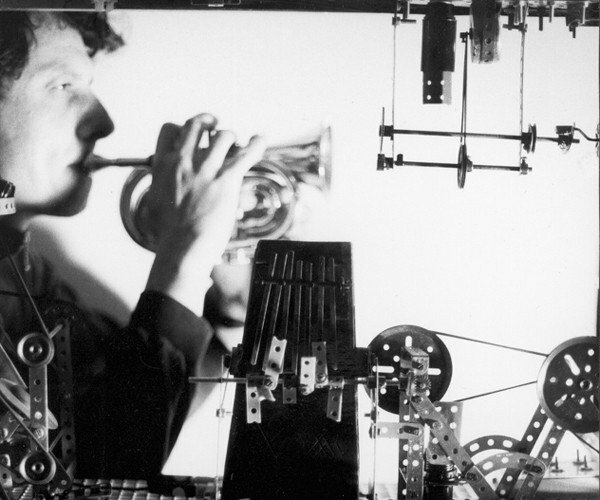 French composer and multi-instrumentalist Pierre Bastien built his first musical machinery in 1977 and has been constantly developing his mechanical orchestra ever since. For his latest work Bastien plays with musicians from the past: the second violins of an Egyptian orchestra; an anonymous Jamaican ritualist; a forgotten Parisian cabaret; the rhythm section of an ancient jazz band. In this atmosphere of resurrected footage the unwilling musicians repeat their part in a loop, much like Bastien's machines. His Meccano orchestra, the projections and his live additions evoke an unexpected emotional ring, a forlorn beauty. Karel Doing's new series of double screen films are all made with ostensibly useless materials; paper cut-outs, artificial hair, discarded negatives and old newspapers constructed in the form of the palindrome - a sequence of elements which appear the same when perceived both forwards and backwards. These films are at once accurate visual representations of complex formulas and playful exercises in style.Karel Doing’s hand built optical toys elicit a hypnotic environment for subterfuge and submersion. His installations use visual feedback that make seemingly insignificant objects expand into a dynamic, pulsating architecture. Louise Curham is a filmmaker and visual artist working predominantly with found and obsolete moving image materials. Curham’s work addresses the givens of cinema – specifically its stoically fixed relationships between projection / audience / image - tearing these ‘morals’ away strip by frame. Louise is most well known for her hand-processed films that are characteristically bold, interrogative and poetic spanning film performance, installation and experimental film. Curham is well recognized within the Australian improvised music community for her contribution of performances at the key events such as the NowNow Festival of Spontaneous Music and OtherFilm, and her work in creating contemporary dance film. Curham has performed and exhibited for SoundOut Festival, Canberra, Melbourne International Arts Festival, Jazz Visions Festival, Sound Lounge, Sydney, Smack Bang Festival, Sydney, NZ International Film Festival & NZ Film Archive, Australian Centre for the Moving Image, Victorian Arts Centre, OtherFilm, Brisbane, and the NowNow, Sydney. Alison Blunt is a leading figure within the London improvised music community performing solo and contributing to countless groups including Barrel, Lode, Hanam, Burning Wood and the London Improvisers Orchestra. Blunt’s fascination with sound, motion and space has lead her to international solo and collaborative projects exploring the boundaries between art forms and genres and creating, continuously performing and recording new music. Blunt’s activities range from commissions for film, theatre and contemporary dance productions, to arranging and recording children’s albums, from performances with interdisciplinary ensembles to touring Early Childhood musical storytelling performances, from gigging with rock bands to gigging with world folk music artists.